the shadows of our minds? Gangs of vampires, their faces the color of bleached bone, stalk the streets of Los Angeles. Boar-faced creatures roam the Earth, their merciless red eyes searching for lost souls on which to feed. Evil takes human form and washes itself in the blood of the dead. At least they do in Rick McCammon's world. 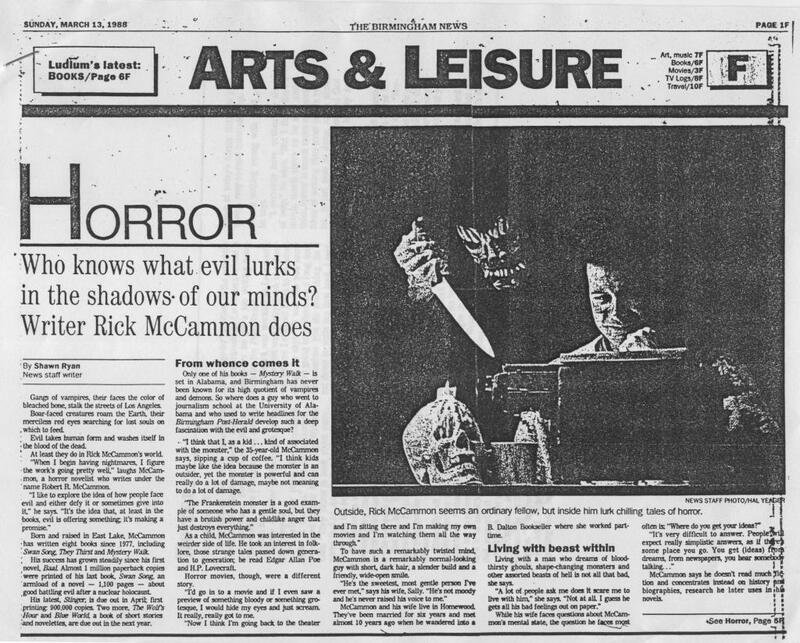 "When I begin having nightmares, I figure the work's going pretty well," laughs McCammon, a horror novelist who writes under the name Robert R. McCammon. "I like to explore the idea of how people face evil and either defy it or sometimes give into It" he says. "It's the idea that, at least in the books, evil is offering something; it's making a promise." Born and raised in East Lake, McCammon has written eight books since 1977, Including Swan Song, They Thirst and Mystery Walk. His success has grown steadily since his first novel, Baal. Almost 1 million paperback copies were printed of his last book, Swan Song, an armload of a novel—1,100 pages—about good battling evil after a nuclear holocaust. His latest, Stinger, is due out in April; first printing: 900.000 copies. Two more, The Wolf's Hour and Blue World, a book of short stories and novelettes, are due out in the next year. Only one of his books—Mystery Walk—is set in Alabama, and Birmingham has never been known for its high quotient of vampires and demons. So where does a guy who went to journalism school at the University of Alabama and who used to write headlines for the Birmingham Post-Herald develop such a deep fascination with the evil and grotesque? "I think that I, as a kid ... kind of associated with the monster," the 35-year-old McCammon says, sipping a cup of coffee. "I think kids maybe like the idea because the monster is an outsider, yet the monster is powerful and can really do a lot of damage, maybe not meaning to do a lot of damage. "The Frankenstein monster is a good example of someone who has a gentle soul, but they have a brutish power and childlike anger that just destroys everything." 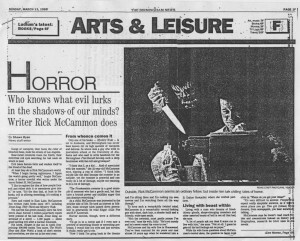 As a child, McCammon was interested in the weirder side of life. He took an interest In folklore, those strange tales passed down generation to generation; he read Edgar Allan Poe and H.P. Lovecraft. Horror movies, though, were a different story. "I'd go in to a movie and if I even saw a preview of something bloody or something grotesque, I would hide my eyes and just scream. It really, really got to me. "Now I think I'm going back to the theater and I'm sitting there and I'm making my own movies and I'm watching them all the way through." To have such a remarkably twisted mind, McCammon is a remarkably normal-looking guy with short, dark hair, a slender build and a friendly, wide-open smile. "He's the sweetest, most gentle person I've ever met," says his wife, Sally. "He's not moody and he's never raised his voice to me." McCammon and his wife live in Homewood. They've been married for six years and met almost 10 years ago when he wandered into a B. Dalton Bookseller where she worked part-time. Living with a man who dreams of blood-thirsty ghouls, shape-changing monsters and other assorted beasts of hell is not all that bad, she says. "A lot of people ask me does it scare me to live with him." she says. "Not at all. I guess he gets all his bad feelings out on paper." While his wife faces questions about McCammon's mental state, the question he faces most often is; "Where do you get your ideas?" "It's very difficult to answer. People will expect really simplistic answers, as if there's some place you go. You get (ideas) from dreams, from newspapers, you hear somebody talking..."
McCammon says he doesn't read much fiction and concentrates instead on history and biographies, research he later uses in his novels. If pinned to the wall, though, he hesitantly lists his favorite horror writers; Peter Straub, Dean Koontz, Jack Cady, John Farris and, of course, Stephen King. Some consider McCammon to be King's equal. "I definitely think McCammon's right at the top," says Mike Garrett, president of the Magic City Writer's club. "They Thirst (a book about vampires on Los Angeles) ranks right up there with the best of Stephen King." 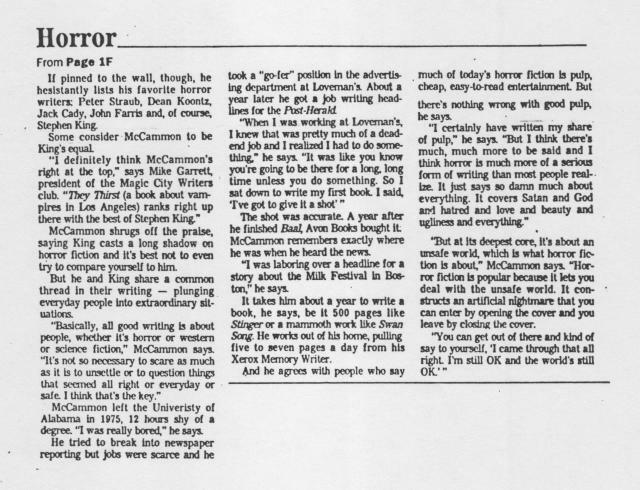 McCammon shrugs off the praise, saying King casts a long shadow on horror fiction and it's best not to even try to compare yourself to him. But he and King share a common thread in their writing—plunging everyday people into extraordinary situations. "Basically, all good writing is about people, whether it's horror or western or science fiction," McCammon says. 'It's not so necessary to scare as much as it is to unsettle or to question things that seemed all right or everyday or safe. I think that's the key." McCammon left the University of Alabama in 1975, 12 hours shy of a degree. "I was really bored," he says. He tried to break into newspaper reporting but jobs were scarce and he took a "go-fer" position in the advertising department at Loveman's. About a year later he got a job writing headlines for the Post-Herald. "When I was working at Loveman's, I knew that was pretty much of a dead-end job and I realized I had to do something," he says. "It was like you know you're going to be there for a long, long time unless you do something. So I sat down to write my first book. I said, I've got to give it a shot." The shot was accurate. A year after he finished Baal, Avon Books bought it. McCammon remembers exactly where he was when he heard the news. "I was laboring over a headline tor a story about the Milk Festival in Boston." he says. It takes him about a year to write a book, he says, be it 500 pages like Stinger or a mammoth work like Swan Song. He works out of his home, pulling five to seven pages a day from his Xerox Memory Writer. And he agrees with people who say much of today's horror fiction is pulp, cheap, easy-to-read entertainment. But there's nothing wrong with good pulp, he says. "I certainly have written my share of pulp," he says. "But I think there's much, much more to be said and I think horror is much more of a serious form of writing than most people realize. It just says so damn much about everything. It covers Satan and God and hatred and love and beauty and ugliness and everything." "But at its deepest core, it's about an unsafe world, which is what horror fiction is about," McCammon says. "Horror fiction is popular because it lets you deal with the unsafe world. It constructs an artificial nightmare that you can enter by opening the cover and you leave by closing the cover. "You can get out of there and kind of say to yourself, 'I came through that all right. I'm still OK and the world's still OK.'"